Cyberduck is a great free FTP client for Mac OS X, but on my portable Mac’s 13″ screen the Growl popup notifications really drive me crazy as they appear on each server connection and transfer completion. Oddly enough, if you look around in the Cyberduck preferences, you won’t find an option to disable the Growl notifications, and this has to be done through the command line instead. 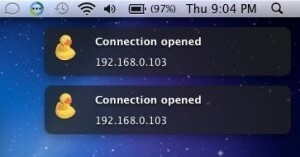 Continue to enjoy Cyberduck, with or without Growl notifications! Update: As several readers pointed out, you can also just disable Growl notifications within the System Preferences on a per app basis. Uh why not just use Growl’s preference pane instead? Dom is right – growl preferences are adjusted in growl. The command line option is to disable Growl support in Cyberduck (which is probably used for debugging). Is CyberDuck the best no-cost Amazon S3 tool for OSX?